Jogging partner Yes! Top dog! The Border Collie isn't for the novice dog owner - he needs time and dedication if he is to be a happy, well-balanced pet. Collie eye anomaly is a hereditary disease that causes abnormal development of the choroid - a layer of tissue under the retina. Puppies can be tested for it from six weeks of age. It can cause anything from minor visual impairment to total blindness. Osteochondritis dissecans is a disease that affects the developing bones and joints, most commonly the elbows and shoulders, in growing dogs from four to nine months of age. Epilepsy is a brain disorder, which causes fits. Hip dysplasia occurs when the hip joint is, or has become, unstable; the conditionvaries in degrees of severity. The Border Collie is listed under the Kennel Club/British Veterinary Association/International Sheep Dog Society Eye Scheme and the KC/BVA Hip Dysplasia Scheme. The average hip score in the Border Collie is 13 (each hip is scored individually and the two figures are added together to give the dog's final hip score). Breeders are advised to use only breeding stock with scores well below this figure. A breeder should be able to provide documentation proving that this has been done. It is also highly recommended, but not compulsory, that parent dogs are given a DNA test for CEA. Incredibly intelligent - will keep you on your toes. Should never be nervous or aggressive. He is best suited to a rural lifestyle with plenty of open space for off-lead exercise. The Border Collie loves to play - especially ball games - but don't overdo it. It's important he knows when a game is over - if given the choice he would fetch all day long. He thrives on company and will not cope well home alone. Leave him for long periods at your peril - "The devil makes work for idle hands." As long as you can offer him the exercise and mental stimulation he requires he will adapt well to life as a family pet. The Border Collie is a sheepdog through and through, and has a very strong, deep-rooted instinct to herd. Early basic training is incredibly important and must be ongoing. He is incredibly intelligent and will happily learn whatever you want to teach him - there are no limits to his learning capabilities. 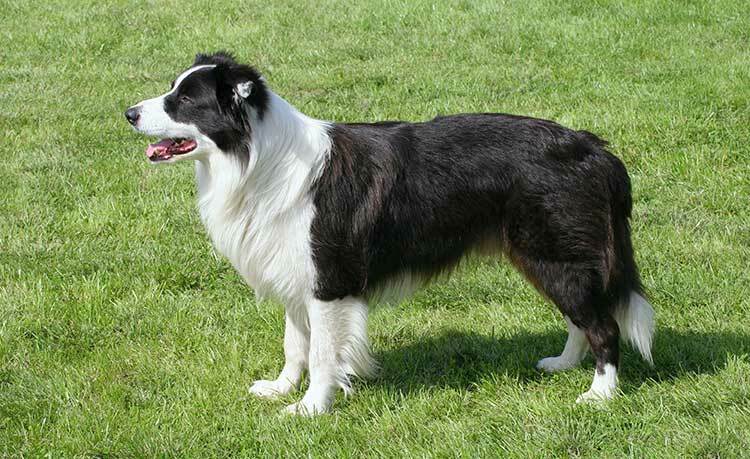 The Border Collie has two distinct coat types - long and smooth. Both have a soft, dense undercoat. Both coat types require a thorough brush over once a week, ensuring you brush through to the skin, removing all dead hair. The Border Collie requires daily exercise. But remember, it's the quality of the exercise he gets that's important, not the quantity. Higher than average exercise needs.